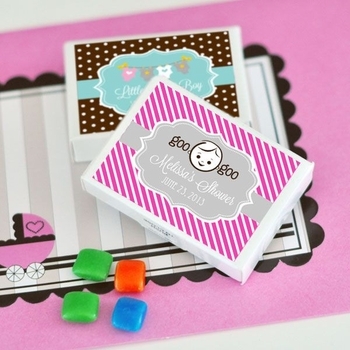 Ideally suited for any baby themed event, these little paper gum boxes favors are filled with colored gum. Note - Assembly required: You apply stickers to each box. Box size: 1.6 by 2.3 inches. See More Images above to see the colors and label designs. Click this link for Label Personalization Tips. Processing Time 4-6 business days. Does not include shipping time. Click More Images below the photo for label design options.